When I was reviewing some photos and videos on screen I noticed some consistently dirty spots. After experimenting a bit I noticed that these spots appear and change in size when I zoom in and out. My guess is that sensor needs to be cleaned. I've seen some YouTube videos about this, but am very leery about taking it on myself. Although I've done plenty of desktop and laptop repairs, I've never tackled opening a camera. Is this something that a reputable repair shop can handle at reasonable cost? I really love the ZS7 and in fact have two of them (I travel extensively and always bring a spare). If this can be fixed, that'd be great. 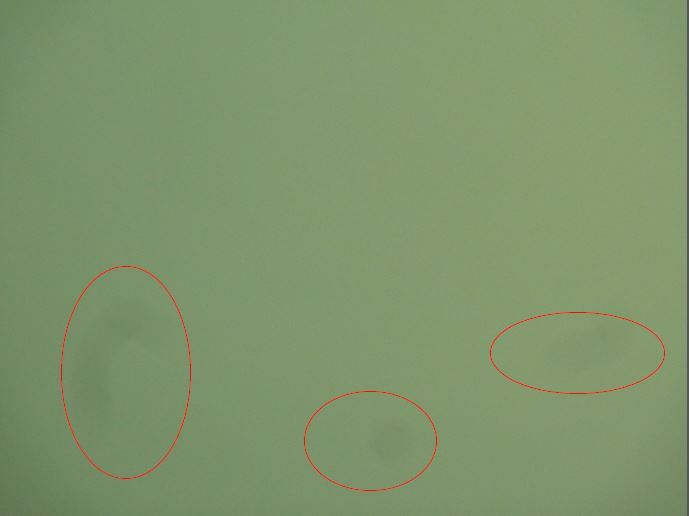 The attached pic shows the problem: I shot against a blank sheet and zoomed. I would try cleaning it myself . If u work on puters , and ur eyes are still good , give it a try. I have 4 zs3's and a zs7 ....one of my zs3's has ur same problem when zoomed at something light colored ( like the sky ). If u take it to a camera shop ur probably going to be spending more than the cameras worth. one of my zs3's has ur same problem when zoomed at something light colored ( like the sky ). That's my fear. I may give it a try. After trying the mobile phone trick (setting a vibrating mobile phone on the lens to hopefully knock the dust off, which did nothing) and doing an exhaustive and futile search on EBay for a comparable replacement, I took it to a highly regarded camera repair place in New York. They said it was definitely the sensor; it came to $70 including tax. I'll pick it up on Monday and will report back. The problem I had with any of those available on EBay was that they all seemed pretty beat up. I always use those removable screen shields and in general take extremely good care of all of my cameras. Spending $175 for a beat up camera or paying $70 to fix mine seemed like a no-brainer. The technician said this is a common problem that's easily resolved. I really wasn't comfortable with the idea of trying to open it up myself. Picked up the ZS7: All good. No signs of dust anywhere.